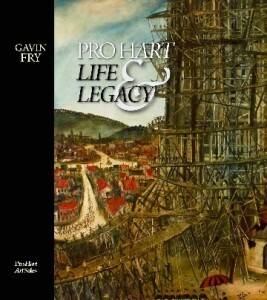 A handful of fascinating new books have recently arrived on the shelves,centred on the visual arts in all of its many guises…..
Gavin Fry has been a prolific writer on Australian art and artists for many years now, and it’s great to see him tackling the extraordinary and contradictory life of Pro Hart, one of our most popular, prolific and reviled artists. Long sneered at by the “serious” art community, and only too happy to present himself in a way tailor made to inflame the cognoscenti, Hart deserves to be taken seriously as both an artist and a public figure. Successful with the public in a way most other artists could only dream about, he created a vision of Australia’s outback that seems to have become part of the national psyche (love it or loathe it), and his seemingly industrial output of these “iconic” images appears to have swamped other aspects of his work deserving of recognition. There are many quite beautiful paintings here, of subjects far removed from our expectations, and it’s marvellous to have them presented in such a lovely way. 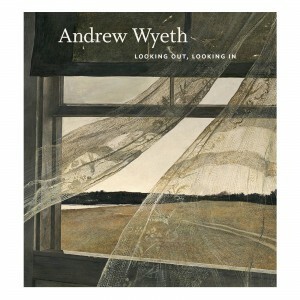 The paintings of American artist Andrew Wyeth carry a weight of meaning seemingly at odds with the apparent straightforwardness of their subject matter, their unabashed realism presenting at first glance relatively simple images which, on closer inspection, manage to unsettle and hint at deeper waters. This study takes as its starting point one of his most famous paintings, Wind From the Sea (1947), a quite beautiful and bleak picture of curtains blowing in the breeze from an open window, and proceeds to examine the important place windows took in his work from that moment on. It might sound finicky, but the authors prove the worth of their approach again and again with some really fine observations and a mass of gorgeous reproductions. The comic book art of Winsor McCay is so astonishing and visionary it is quite difficult to reconcile it with the gruelling schedule of turn-of-the-century American newspaper publishing; until, that is, one realises just what a powerhouse of creativity these Sunday funnies were! But even within this extraordinary milieu McCay’s work on strips like Little Nemo and Dream of the Rarebit Fiend (mind boggling!) stands as something particularly remarkable. 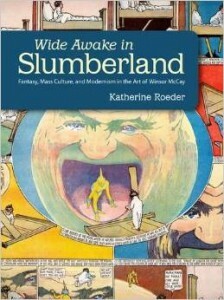 This terrific book (packed with splendid examples of his work) places his wildly inventive visual style within the context of the broader popular and consumerist culture of the day, reflecting the impact of early film, art nouveau style and a host of other trends overtaking modern American life at the time. Dazzling! 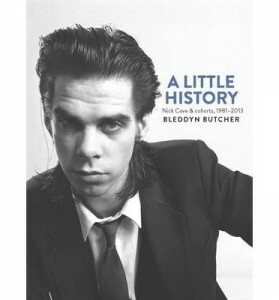 Photographer Bleddyn Butcher first caught the Nick Cave bug in 1981 and there’s been no looking back since then. This photo-essay on the man and his compatriots is the result of many years deeply embedded in the entourage of one of Australia’s greatest and most unique musicians, and his recollections of the life and times are often as revealing as his wonderful photos. And for those unacqainted with his practice: Oh Mr Hart…….